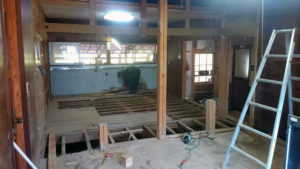 It is a blog about DIY renovation of a traditional Japanese house in Iga City, following the previous blog “DIY renovation of traditional Japanese house ―― part2”. 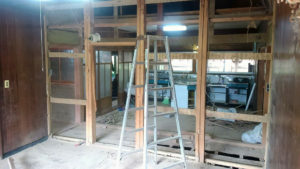 We removed traditional Japanese mud wall until the last time (the picture below). A little time passed since the last work. Today’s work begins with the removal of mud and wood scattered on the floor. Actually, this work is hardest for us. The clay wall is heavy, cvered in dust, and additionally the scaffolding is bad. We get tired right away. We separated it into mud and timber from the morning, packed it in bags and carried it out of the house little by little. It was around noon when I finished this work. next! 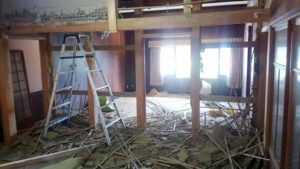 removing unnecessary woody pillars, we can feel this as a large room. I left the one in the middle and removed the pillars. Oh! we can feel it is very spacious! The next task is to strip off old floorboards. Since the floor board has deteriorated, it was removed off with a simple tool, so we was able to finish this work more quickly than expected. 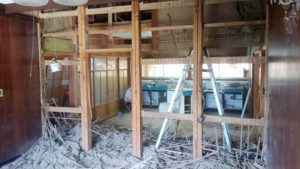 The purpose of our DIY renovation is to combine the two rooms into spacious room. We could remov off the floorboard of half of them (one room) and skeleton it. 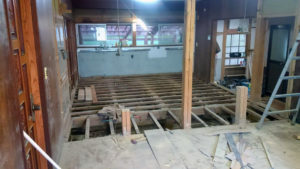 Next time, it is work by removing the other half of the floor board and lay a floor with new board. 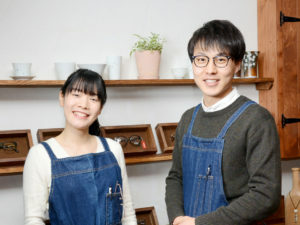 Please look forward to!